Juliana Village Naples Lakes Country Club Condos: Gulfshore Magazine announced that Naples Lakes Country Club has been voted as #1 in the “Best Country Club” category in SWFL for 2018. Also, The Audubon Society named NLCC as the winner of Audubon’s International BioBlitz Award - #1 for Golf Course Communities in the world! New to the market with unique views from this stunning 2nd floor coach home on the 18th fairway, green, clubhouse and fountain. One of the best locations in the village with wrap around water views from your spacious lanai. Extensive upgrades include private elevator, electric roll down shutters on every window, center island, 42" light wood kitchen cabinets, tile on the diagonal, crown molding, upgraded fans and light fixtures, stainless steel appliances, newer a/c with uv light, new hot mwater heater, pro video outdoor system for front door and custom paint. One major advantage of this bundled golf community is the benefit of having your own private golf cart! Enjoy fine or casual dining indoors or outdoors in the 23,500 square foot clubhouse. Work out in the attended fitness center or play tennis on one of the 5 Har-Tru courts. Your fees include Comcast/Xfinity Hi Speed Internet and Basic HD cable package. Juliana Village Naples Lakes Country Club Condos: Naples Lakes is a bundled golf community. Quiet location with view of golf course. New air conditioning unit, Plantation shutters, tile, open floor plan. New air conditioning unit. Beautiful Clubhouse and restaurant, exercise room and driving range. Close to beaches, dining, entertainment and shopping. Easy to show. Juliana Village Naples Lakes Country Club Condos: PRICE REDUCED ON THIS STUNNING FIRST FLOOR COACH HOME THAT HAS BEEN BEAUTIFULLY UPDATED & IN PRISTINE CONDITION. On cul-de-sac street, just steps to par 3, hole #13 of Arnold Palmer Signature Course. Spacious great room design with open kitchen featuring upgraded cabinets, center island, walk-in pantry, breakfast bar, granite countertops, new stainless refrigerator & microwave. Crown molding, plantation shutters, upgraded fans & lighting throughout. French doors & wood floor in den. Master bedroom is 18' x 16' with hardwood floor & huge 12' x 8' walk-in closet. Generous master bath with garden tub, seamless shower, framed mirror, & dual vanities. New high efficiency A/C 3 years ago with wi-fi thermostat. Tiled wrap-around lanai offers plenty of room for relaxing or entertaining. Two-car attached garage. Located in quiet area of the complex, & just a short walk to the community pool & spa. Naples Lakes is a gated, bundled golf community with private membership in the recently renovated Arnold Palmer Signature Golf Course, plus aqua range, cabana grill, newly renovated clubhouse, resort pool/spa, state-of-the art fitness center, excellent tennis program, & audubon designation. 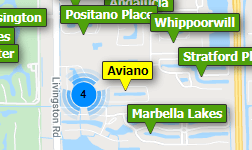 Juliana Village Naples Lakes Country Club Condos: PROVIDENCE! SUPER LAKE + FAIRWAY VIEWS. THIS 1ST FLOOR END UNIT WITH $50,000+/- IN UPGRADES. THIS 3 BEDROOM, 2 BATH, 2 CAR GARAGE + GOLF CART (OWN YOUR OWN) GARAGE A "PREMIER BEST BUY" PROPERTY. ALL ASSESSMENTS FOR CLUBHOUSE + GOLF REMODEL ARE PAID ($10,000 ADDED VALUE). ARNOLD PALMER SIGNATURE COURSE INCLUDED WITH OWNERSHIP. WALK TO CLUBHOUSE, RESTAURANT + RESORT STYLE POOL. 10' CEILING AND ALL CUSTOM WOOD DOUBLE CROWN MOLDING THROUGHOUT HOME. ALL TILE FLOORS IN LIVING, DINING, KITCHEN + BATHROOMS. A "CHEFS" BIG KITCHEN FOR THE GOURMET IN YOU. ALL WOOD CABINETS, TOP OF THE LINE NEW FRIGIDAIRE STAINLESS STEEL APPLIANCES. HUGE MASTER BEDROOM W/LARGE 12'X8' WALK-IN CLOSET, HIS/HERS SINKS, SOAKING TUB, AND WALK-IN SHOWER. SUPER BIG WRAP-A-ROUND LANAI OVERLOOKING LAKE + GOLF COURSE 18TH HOLE. PAVER DRIVEWAY AND SIDEWALK. CUSTOM CLEAR ACRYLIC WINDOW/SLIDER STORM PANELS. MAGNIFICENT ($6,000,000 REMODELED) CLUBHOUSE, CASUAL + FORMAL DINING, CABANA BAR, STATE-OF-ART HEALTH + WELLNESS CENTER, TENNIS COURTS, RESORT STYLE POOL/SPA. EASY ACCESS TO THE BEACH AND DOWNTOWN, 5TH AVE FOR SHOPPING, RESTAURANTS, AND ENTERTAINMENT. HOME COMES WITH 1 YEAR HOME WARRANTY FOR TOTAL BUYER COMFORT. Juliana Village Naples Lakes Country Club Condos: Private elevator to your second floor beautifully furnished coach home with attached 2 car garage. All the space and privacy you'll need in this spacious, 3 bedrooms, den, and an open floor plan encompassing the living room, dining room and kitchen. Large tile though out the main living area, high ceilings, and crown molding. Located on the 12th fairway, relax and enjoy the open golf course views from the large screened lanai with morning sun. NLCC boasts an Arnold Palmer Signature Golf Course, one of only two in SW Florida. Practice facilities include a massive aqua range with two putting greens and a practice chipping green with bunkers. Other onsite amenities include: Dining in the Grille Room, outdoor Terrace for casual elegance, or the Dining Room offers a variety of themed parties. Year-round tennis program played on five state of the art hydro-grid courts, and professional exhibitions. The Fitness Center boasts Cybex equipment and a robust mix of healthy classes. In Juliana village, enjoy the private pool or stop by an enjoy the Country Club and use the Junior Olympic size pool and spa. Voted #1 Best Country Club in SWFL. CLUBHOUSE RENOVATION ASSESSMENT HAS BEEN PAID. Lake Juliana Naples Lakes Country Club Condos: SPECIAL ASSESSMENTS FOR THE GOLF COURSE AND CLUBHOUSE WERE PAID OFF ON MARCH 1 2019. This reduces buyers living expenses considerably. Makes owning in Naples Lakes less expensive than other comparable communities. Naples Lakes is the finest golf included community in Naples and the Arnold Palmer designed golf course has just be redone and it is beautiful. Home has many upgrades including wood floors in bedrooms and den and on the steps. New appliances a little over a years ago. Unit is in excellent shape. See this beautiful coach home you will not be disappointed. Juliana Village Naples Lakes Country Club Condos: This move-in ready coach home in Naples Lakes CC, a community that Gulfshore Business Magazine recently named the winner in the “Best Country Club” category for SWFL for 2018. The Audubon Society has named NLCC as the winner of Audubon’s International BioBlitz Award - #1 for Golf Course Communities in the world! With 2030 square feet under air and 2 bedrooms, a den and 2 baths this first floor coach home is large enough for family and friends and is priced to sell! There is a golf course view with Eastern exposure so you can enjoy bright, sunny mornings on your screened-in lanai watching the play on the newly renovated Arnold Palmer designed Signature golf course. This home was repainted in 2017 and features a spacious eat in kitchen, breakfast bar, a renovated kitchen with granite counter tops and new appliances. The golf course renovation assessment has been paid and the clubhouse assessment will be paid with a credit at closing. Enjoy fine or casual dining in the state of the art clubhouse with both indoor and outdoor seating, tennis, an attended fitness center, pro shop and more. A short drive to Naples shopping, restaurants and beaches makes the location perfect. Juliana Village Naples Lakes Country Club Condos: Gulfshore Magazine announced that Naples Lakes Country Club has been voted as #1 in the “Best Country Club” category in SWFL for 2018. Also, The Audubon Society named NLCC as the winner of Audubon’s International BioBlitz Award - #1 for Golf Course Communities in the world! This Coach Home is rented - the buyer will honor the lease and take in the rental money! Lowest Priced Coach Home! This is a terrific first floor coach home with eastern exposure has ALL NEW APPLIANCES and large Lanai There are 2 bedrooms, 2 baths and a Den with a two-car garage. There is 2,030 sq. ft. under air. The view is of the lake and 12th fairway. The oversized “L” shaped lanai has three new ceiling fans and overlooks the golf course. The spacious Master Suite features Dual Sinks in the Master Bath, a Walk In Closet with built in cabinets and a door to the lanai. The kitchen features a breakfast bar, Center Island, Naples Lakes Country Club includes Comcast/Xfinity Hi Speed Internet and Basic HD cable package with the X-1 box. Naples Lakes Country Club is a Bundled Golf Community with an Arnold Palmer Designed Golf Course that has been totally renovated and is OPEN for play. NInvestment opportunity! Lake Arrowhead Naples Lakes Country Club Condos: This top floor end unit is in pristine condition, offers great views of Hole 10 fairway and green, gorgeous sunsets and is a short walk to the Lake Arrowhead community pool. Furnishings and custom window treatments are lovely in this spacious, bright San Gabriel floor plan. Engineered hardwood floors throughout the main living areas. Microwave and refrigerator updated in 2015, washer and dryer updated in 2017, hot water heater 1 year old. HVAC updated in 2013. SELLERS HAVE PAID THE CLUBHOUSE RENOVATION FEE AND THE GOLF COURSE RENOVATION FEE. Naples Lakes Country Club is a bundled golf community and the recently renovated Arnold Palmer Signature Golf course. NLCC has been named “Best Country Club” for 2018 by Gulfshore Business Magazine, and has received the “Biodiversity Award” from the International Audobon Society. NLCC also offers and Award winning clubhouse with fitness center, active tennis program with a full-time Pro, cabana grill, resort pool/spa, aqua driving range and putting greens. NLCC is a short distance to Olde Naples/5th Avenue shopping, restaurants, Naples Pier/beach, Marco Island and I-75. Lake Barrington Naples Lakes Country Club Condos: BIG PRICE REDUCTION! GOLF MEMBERSHIP INCLUDED. Clubhouse renovation special assessment has been paid in-full. Highly-desired top floor "Wadsworth" 2BR+Den/2BA condo (Note: Den has French doors and can be used as a 3rd BR), with a 2+ car garage on the 1st floor of the building. It features a SPECTACULAR view of TWO golf holes...looking directly down on the 17th green, and a panoramic, full-length view of the par 5 18th hole! It's loaded with expensive upgrades...granite countertops in the kitchen and bathrooms; granite backsplash in the kitchen; SS appliances; high-end natural wood cabinets; crown molding throughout the main living area; 20" diagonal tile; decorator light and plumbing fixtures. NLCC is one of Naples'/SWFL's premier "bundled" golf communities, highlighted by a newly-renovated Arnold Palmer "Signature" golf course, an award-winning remodeled 24,000sf clubhouse, an outstanding tennis program, and superb swimming and fitness facilities. NLCC is located just 15-minutes from Olde Naples/5th Ave., Naples Pier/beach, and Marco Island; and, 35-minutes from SWFL International Airport. Also, only a 1/4-mile from the state-of-the-art Physician's Regional Hospital. Juliana Village Naples Lakes Country Club Condos: A first floor coach home located in Naples Lakes CC, a community Gulfshore Business Magazine announced has been voted as #1 in the “Best Country Club” category for SWFL for 2018. The Audubon Society has also named NLCC as the winner of Audubon’s International BioBlitz Award - #1 for Golf Course Communities in the world! With a view of the lake and 18th green of the Arnold Palmer designed Signature golf course and a Western exposure this unit is perfectly located. The Western exposure is perfect for beautiful sunsets on the L-shaped, screened-in lanai. At over 2,000 square feet under air , 2 bedrooms and a den and 2 baths, there is plenty of room for everyone and. Enjoy the 23,000 square foot clubhouse with both casual and fine dining, indoor or outdoor seating, an attended fitness center and more. If you play tennis, there is a very active tennis program. You can have a personal golf cart and one actually comes with this unit! NLCC is located close to downtown Naples restaurants, beaches and shopping. A must see. Lake Arrowhead Naples Lakes Country Club Condos: A lovely second floor carriage home located in Naples Lakes CC, a community that Gulfshore Business Magazine announced has been voted as #1 in the “Best Country Club” category in SWFL for 2018. The Audubon Society has also named NLCC as the winner of Audubon’s International BioBlitz Award - #1 for Golf Course Communities in the world! Lots of upgrades including crown molding and new carpeting in the bedrooms and new A./C. Large screened-in, tiled lanai overlooks the 10th hole of the newly renovated Arnold Palmer Signature golf course. With 3 bedrooms and 2 baths and 1,975 square feet under air in this open, great room design, there is plenty of room for family and friends. Enjoy fine or casual, indoor or outdoor dining in the state of the art clubhouse that includes an attended fitness center, full service pro shop, 5 Har-Tru tennis courts and a choice of village or community pools and spas. Naples Lakes has all the amenities you would expect in one of Naples finest bundled communities. Lake Arrowhead Naples Lakes Country Club Condos: ABSOLUTELY GORGEOUS FIRST FLOOR END UNIT. Impeccably maintained and beautifully furnished Turnkey! Quiet location with a great view of Hole #10 on the Arnold Palmer Golf Course, and just a short walk to the community pool/spa. This spacious open floor plan features 1908 sq. ft. with 9 ft. ceilings and is loaded with upgrades. Newly painted, large tile on the diagonal, crown molding throughout, custom cornices, upgraded lighting and fans, tiled lanai, and new A/C in 2017. Nicely appointed kitchen offers breakfast bar, pantry, newer refrigerator and garbage disposal, tumbled marble backsplash, and adjacent 10' x10' breakfast nook. Great room measures 20' x 16' and adjacent dining room is 14' x 11'. Generous master bedroom is 19' x 13' with 2 closets (one walk-in). Master bath has dual vanities walk-in shower and garden tub. NLCC is a bundled golf community with private membership in an Arnold Palmer Signature Golf Course, excellent tennis program, newly renovated clubhouse, fitness center, cabana grill, resort pool/spa, aqua driving range and putting greens. Short distance to 5th. Ave., shopping, beaches, restaurants and I-75. No clubhouse minimum and you can own your own golf cart. Lake Arrowhead Naples Lakes Country Club Condos: MOTIVATED SELLER will accept reasonable offer. Second Floor carriage home with great views of the golf course, next to the community pool on the end of the cul de sac. Open floor plan features 3 bedrooms, 2 bath, formal dining area, great room plus dinette area. A/C was replaced 3 years ago. Naples Lakes is a bundled golf community with private membership, newly renovated Arnold Palmer Signature Golf Course, excellent tennis program, newly renovated clubhouse, cabana grill, state-of-the-art fitness center, aqua driving range and putting greens, resort pool and spa. Five miles from downtown Naples, shopping and our beautiful beaches. Lake Arrowhead Naples Lakes Country Club Condos: Ahhhh... Relaxing on the lanai! FIRST FLOOR END UNIT with an unobstructed wide open view of the 10th hole, perfect! Not the tee box, not the "slice" zone and no cart path in sight, you're 30 yards to the green in case your neighbor asks if you saw his birdie putt. This Montebello model comes Turnkey Furnished and is in immaculate condition. Being an END UNIT it has windows on three sides letting the natural light pour in and with the recent paint, furnishings and fixtures, it truly is Move In Ready! The walk in closet, walk in shower and wide open floor plan are just some of the nice touches that make this unit special. A fantastic lot position located toward the end of the cul-de-sac and steps to the pool. Naples Lakes CC has been recently renovated, both course and club are brilliant! The Arnold Palmer golf course is one of the best, if not the best bundled courses in town and combined with the state of the art fitness center, resort style pool and spa, impressive tennis program, renovated club house and full practice facilities makes this community tough to beat! Naples Lakes also allows its members to have private carts, the country club lifestyle at its best! Lake Arrowhead Naples Lakes Country Club Condos: C. 15536 Nicely appointed, turnkey second floor end unit in "move in" condition. Unit offers panoramic views of the golf course and pond and conveniently located to the community pool and Naples Lakes clubhouse. The large open floor plan features 3 bedrooms, 2 baths, a 20' x 16' great room, formal dining area, dinette open to the kitchen and breakfast bar for ease of entertaining. The 20' x 13' foot master bedroom features a walk-in closet and large bath with dual vanities, garden tub and walk-in shower and the ultimate privacy of a split bedroom plan. NLCC is a bundled golf community featuring a challanging Arnold Palmer design 18 hole golf course, excellent tennis program, recently renovated clubhouse, cabana, grill and stay of the art fitness center. Juliana Village Naples Lakes Country Club Condos: Just moments from the world famous beaches, restaurants, shopping and cultural attractions of Naples and Marco Island, there is a high quality of living hidden away behind the gates of Naples Lakes. The community was built by the world famous Toll Brothers and paired with an award-winning 18 hole, Arnold Palmer Signature golf course. This clean, well-maintained condo, located entirely on the first floor and features 2 bedrooms, 2 bathrooms, 2 car garage and a den. With peaceful lake views, open concept main living area, full furnishings and power hurricane shutters, you will be glad you came. Lake Barrington Naples Lakes Country Club Condos: MUST SEE POPULAR GATED GOLF COMMUNITY TWN BEDROOMS TWO BATHS WITH 2 CAR GARAGE AND GOLF MEMBERSHIP INCLUDED. THIS TURNKEY PROPERTY OFFERS LARGE OPEN SPACIOUS FLOOR PLAN WITH LARGE ROOMS GREAT FOR ENTERTAINING. NAPLES LAKES HAS FABULOUS CLUBHOUSE WITH LARGE SPACIOUS COMMUNITY POOL AND SPA, TENNIS COURTS AND ARNOLD PALMER GOLFCOURSE. THIS UNIT IS PRICED TO SELL!! Lake Barrington Naples Lakes Country Club Condos: Ideal location! Quiet top floor Donovan model condo with a great lanai view of lake and golf course and two car garage. Main living area has upgraded tile on the diagonal, accent lighting, crown moldings and custom mirrors. The kitchen has granite countertops, upgraded cabinets with a pantry and breakfast area. The master bedroom has 2 closets (one walk-in), the master bathroom has dual sinks and shower. Spacious living room with an adjacent dining room. Second guest bedroom with bathroom and tub/shower. Laundry room with washer/dryer and 2-car garage. This condo is beautifully decorated with exceptional furniture included. AC is only 3 years old and has a new hot water heater. The brand new renovated Arnold Palmer Signature Golf Course is now open, newly enlarged Clubhouse with fitness center and dining and great tennis program. You can also have your own golf cart. Lake Arrowhead Naples Lakes Country Club Condos: FANTASTIC VIEW! FANTASTIC PRICE! Lowest price for a first floor end-unit. Great room design of 1,908 sf. with 9 ft. ceilings, this spacious 3-bedroom, 2 bath home with attached garage overlooks the lake and green of newly renovated Arnold Palmer Signature Golf Course. Bright and cheery white kitchen with breakfast bar, pantry, newer refrigerator & solid surface countertops, plus adjacent 10' x 10' breakfast nook. Plantation shutters throughout & new A/C one year ago. Generous master bedroom measures 17' x 13' with 2 closets (one walk-in) plus entry to lanai. Master bath features dual vanities, walk-in shower & garden tub. Naples Lakes C.C. is a bundled golf community with private membership, excellent tennis program, newly renovated clubhouse featuring fine dining & casual fare, attended fitness center, cabana grill, resort pool/spa, aqua driving range & putting greens. Conveniently located near shopping, restaurants, & beaches. Recently named "Best Country Club for 2018" by Gulfshore Bus. Magazine, and has received the "Biodiversity Award" from the International Audubon Society. A great opportunity and great price for a 3-bedroom end unit in an award-winning community. Need professional assistance selling your property at Naples Lakes Country Club Naples? Find out how an Area Specialist can help to generate more property exposure in order to get the most money for your investment in the least amount of time.